Although almost 29,000 people commit suicide in Russia every year, the country is no longer in the list of ten countries with the highest suicide rate. However, the country’s teenage suicide rate is the highest in Europe. Over the past 20 years, the number of suicides in Russia has almost halved. Where in 1993, 56,136 people committed suicide, the figure came down to 28,779 suicides in 2013, according to the Federal State Statistics Service (Rosstat). “Suicide rates are an objective indicator of social disadvantage,” said Boris Polozhiy, the head of environmental and social issues at the Serbsky State Scientific Centre for Social and Forensic Psychiatry. “In the first half of the 90s, we saw a period of radical social and political reforms in Russia, and during this period the suicide rate rose. It reached its peak in 1994-95, aided by the prolonged complex social situation in the country,” he said. The next peak in suicides occurred in 1999. The economic crisis of 1998 was one of the worst in Russian history. On August 17, the country was defaulted on its debt, as the government refused to continue to prop up the rouble against the dollar. The difficult situation in the country produced a terrible figure – 57,276 suicides. However, experts are sceptical of this figure, noting that in official reports of death, suicide is often blamed on accidents. For many years, suicide has been among the ten leading causes of death of Russians, twice the number of homicides. According to Rosstat, in 2013, 14,427 people lost their lives at the hands of others, and 28,779 killed themselves. The highest risk is for people in the arts, elderly people, who have just retired, lost their soul mate or parted with children and teenagers. 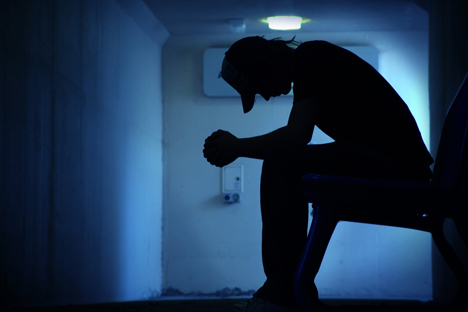 The number of suicides among teenagers does not depend on the social situation. “Therefore, although we are seeing an overall reduction in the incidence of suicide in the country, suicide among adolescents remains high, and positive change has not been observed,” said Polozhiy. When it comes to suicide among in the 15 to 19 age group, Russia is in first place in Europe. In 2011, Russia saw an average of 16 cases of suicide per 100,000 adolescents, which exceeds the global data by more than double. “Adolescents are vulnerable, their minds are unstable, and any remark or joke can lead to profound experiences,” says school psychologist Ekaterina Zherdeva. “Due to lack of experience, they have very painful reactions to any changes, including moving, divorce of parents, quarrelling with friends, or conflicts in school. In addition, they are sensitive about their appearance,” she says. Psychologists have identified two main causes of suicides among Russian teenagers – conflicts with parents and unrequited love, and they both are a sign of age. “Only 10 percent really want to escape life. Ninety percent of the cases are a “cry for help,” Zherdeva added. “Teenagers think that they will die, everyone will come to their funeral and mourn, regret, and realize how good they were and how they were underappreciated. Then they will have a movie made about them, and suddenly life becomes beautiful and amazing. Unfortunately, teenagers do not understand death very well,” she said. Any trivial event, as adults see it, can lead to tragedy. In April this year Kaluga was shaken by the case of a 12-year-old boy who hanged himself because he received a poor score in an exam. The peak of suicides traditionally occurs in the spring, and this is a global trend. The indicators are unevenly distributed in Russia. For example, in 2013, the suicide rate was higher in disadvantaged regions like the Republic of Altai, Buryatia, and Tuva, where the suicide rate has reached 58-67 cases per 100,000, while the national average was around 29-32 cases per 100,000. Russia is fighting with these grim statistics at the state level, blocking suicide-themed Internet sites and creating hotlines, but psychologists believe that the primary prevention of suicide is proper education. Only love and attention can help one grow a personality confident and resistant to any social and domestic stress.